Travel Photo Blogging: Wordless Wednesday: What's on the menu? Nice clear, vivid and sharp! Great colors and composition. Nice job. Thanks for dropping by. Thanks for the compliments! You are very much welcome to drop by again. Nice! Where is it exactly? Happy WW and thanks for the visit! 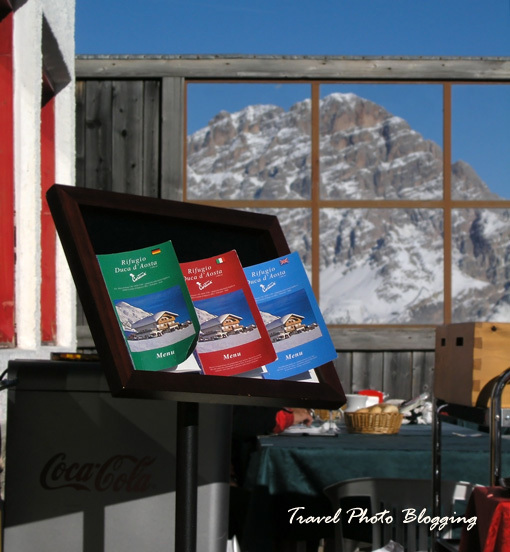 The photo was taken near Cortina d'Ampezzo (Italian Dolomites) in front of one of many restaurants/huts within the local ski area.